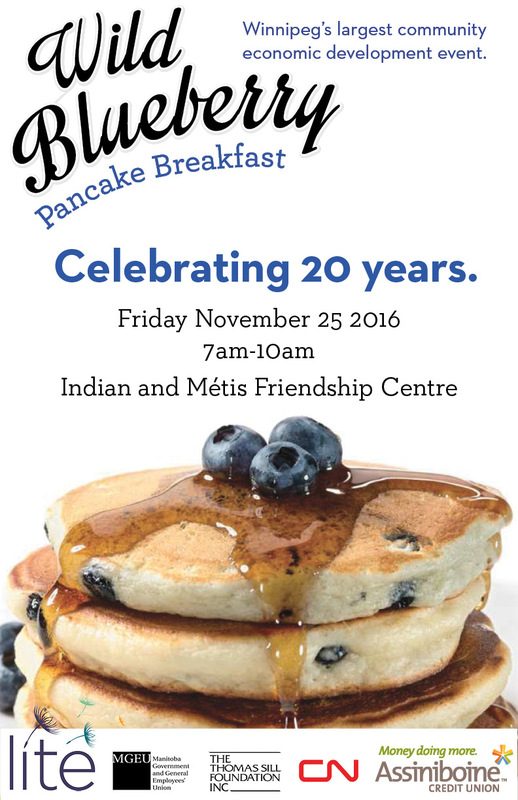 November 25, 2016 – 20th Wild Blueberry Pancake Breakfast!! The Wild Blueberry Pancake Breakfast is now in it’s 20th year!! This year’s breakfast event is taking place on Friday November 25, from 7 AM – 10 AM at the Indian and Métis Friendship Centre (45 Robinson Street). You can expect 1000 community-minded people, 2000 blueberry pancakes accompanied with other yummy breakfast items, a crafters market featuring 24 stalls for local artisans to sell their handmade wares, a dedicated Kids Area for our littlest supporters AND talented local performers. Did you know that by attending this event you’re supporting LITE’s Alternative Christmas Hamper Campaign – which last year resulted in hamper goods for 1600 inner city people in need? Your $20 ticket purchase also supports our 5 catering partners; Spence Neighbourhood Association, Wolseley Family Place, Neechi Foods, Andrews Street Family Centre and Native Women’s Transition Centre.